It can be difficult to find activities for guests to participate in at a party. You want to be sure to feature activities that appeal to all sorts of people with different interests. Luckily, there can be several solutions to this dilemma. Are you a sports fanatic? Do you enjoy playing games and promoting friendly competition? One option is to incorporate games into an event. Boccerball, specifically, is a crowd pleaser that excites guests and promotes friendly matchups. If you want to think about putting on a themed event, boccerball would fit perfectly in a sports theme. 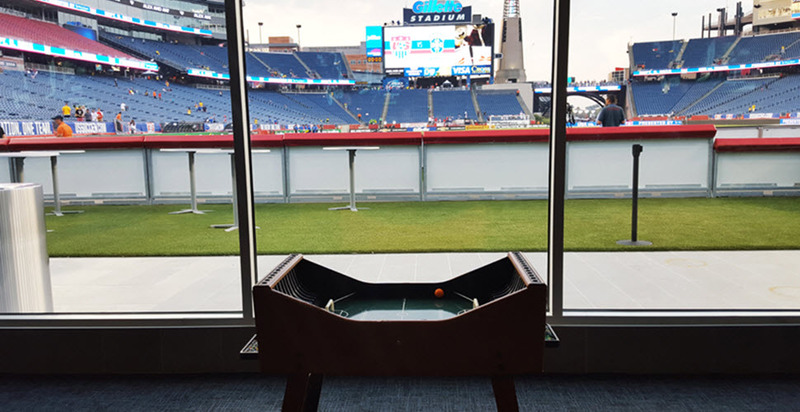 Imagine how a boccerball table would be the perfect addition to an event impeccably decorated with your favorite sports teams. Boccerball is a fast-paced game in which two competitors use marbles to control and move a soccer ball on the table. For one party idea, the game’s quick-paced nature would be perfect during the commercial break of a game watch. Boccerball could also be featured with other games that we offer. In addition to boccerball, we offer double-shot basketball, foosball, golf challenge, football toss, and many more games. Discussing other options with a professional event planner can give you more insight about how to incorporate this fun game with a theme! Boccerball can be the main attraction of the party. If you are hosting for a workplace or a family that enjoys competing with each other, maybe you could create a boccerball tournament. If you would like, you can even rent out multiple boccerboard tables and have different brackets of the tournament playing at once. The winner of the tournament can take home a prize! Boccerboard is a game for people of all ages, fitness levels, and experience. If you have never played boccerball before, it is easy to learn the rules. Maybe the idea of playing games that require lots of physical exertion (like soccer, or volleyball) sound exhausting to you. Boccerball lets you enjoy competition while remaining stationary. Maybe your event is for a large number of people who may not all be up for a tournament. Boccerball can be a fun attraction by itself. Boccerball can be a good icebreaker for guests who do not know each other that well. People who want to can play a game or two. The game is also fast paced, so if your guests just want to try out one round, they only have to commit to a few minutes. Those who prefer watching can stand by and enjoy a thrilling game! If you are interested in boccerball, we have all the equipment necessary for a fun party addition. All you need to provide is adequate space! A 6-foot by 3-foot area is required to fit a boccerball table. No electricity is required for this game. We have multiple boards if you want to have several games going at once. For added fun, this game can be part of our Sports Game Packages with a referee dressed attendant. 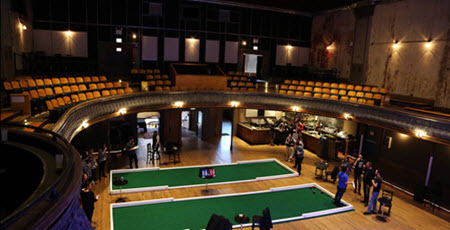 Having games at your event is a great way to take a corporate event or a family reunion to the next level. We can even brand some of the games with your corporate logo, or family reunion design. The possibilities are endless to make your event unique and special! Creative Event Services is an event planning company with staff passionate about creating unique experiences and memories at events. Serving Boston, Hartford, and New York, Creative Event Services has put on thousands of themed events for top corporations, universities, and private parties. We are at the top of the event planning industry. The events we have planned include: birthday parties, corporate events, graduations, private events, weddings, bar mitzvahs/bat mitzvahs, fundraisers, holiday parties, and trade shows. Rest assured that we can help you put on the event of your dreams! If you are stressed about planning that perfect sport-themed event, no need to worry any longer. Get in touch with one of our event planners today, and relax knowing your event is in great hands. With our many years of experience, we make the planning process as smooth as possible. We look forward to planning your next great party.